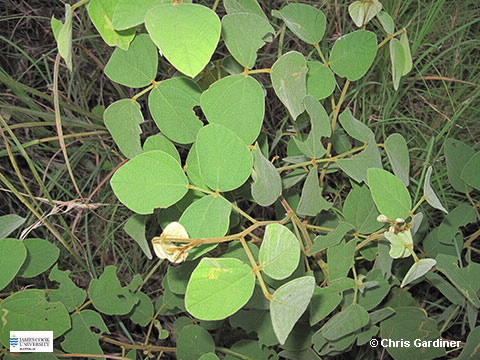 An erect shrub to 2 m tall, but sometimes sprawling, stems densely covered with rusty hairs. Leaves with 3 leaflets broadest above the middle to 11.5 cm long, lower surface densely covered with soft hairs; resin glands present on both surfaces. Flowers pea-shaped in axillary or terminal racemes, flowers usually occurring in pairs along the rachis; corolla yellow, standard to 13 mm long. Pod to 3.5 cm long, flattened densely covered in rusty hairs at maturity, resin glands also present. Seeds 2-8 per pod.